Squishy is one of our favourite cats (it’s just his “stage name”) and he’s as happy as we are to be able to offer a super duper discount promotion on .cat domain names. The promotion is pretty simple. The next 300 .cat domain names registered via us will be available at the discounted price of €9.99 for a one year registration. Parles català? Ho fa el teu web? Aconsegueix el teu .cat avui amb Blacknight! And if you don’t speak Catalan .. Speak Catalan? Does your website? 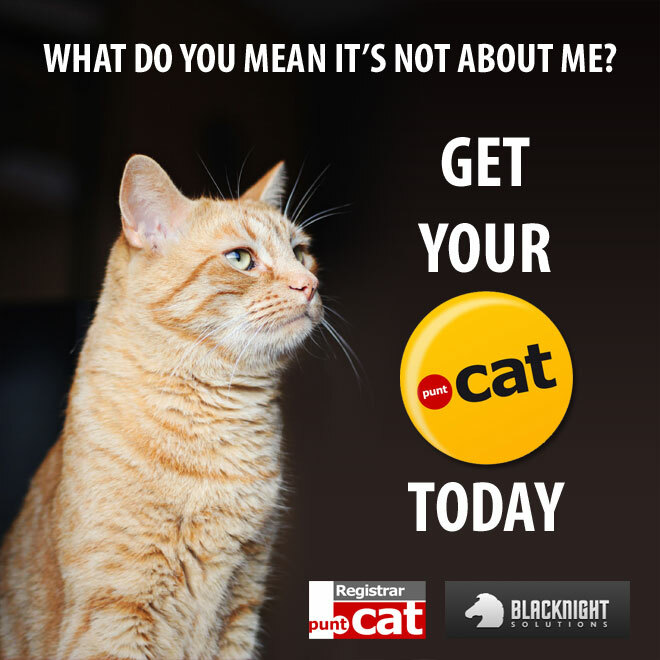 Get your .cat from Blacknight today! NB: You can apply for a .cat domain if you belong to the Catalan cultural and linguistic community in the Internet. The main prerequisite to registering a .cat domain is that there is an intention to use Catalan on the website. Catalan does not need to be the primary language of the website. To this effect there is a 6 month deadline in place by which the website should be using Catalan. Do you intend to use Catalan on the site? If so check if your domain is available.